This year as the president of the newly formed Brownsville Area High School Gay Straight Alliance (GSA)*, I have had the honor of being the student organizer for the Day of Silence. I managed to bring the Day of Silence to my school despite opposition from the administration, which tried to infringe upon our rights by forbidding us from using the school’s PA system to explain the event and wearing T-shirts with messages about the Day of Silence. If it were not for the help of the ACLU of Pennsylvania, their efforts to block us might have been successful. Although the school made assurances that they would allow the Day of Silence, when I sought pre-approval for these activities from the administration, all of my requests were denied. At the same time the school allowed another student organization to do the exact same things for another event. It was only after receiving a letter from the ACLU-PA explaining our rights that the administration allowed us to proceed. The Day of Silence, recognized on April 20 this year, is a student-led action that began 17 years ago at the University of Virginia. On that day, students take a vow of silence to bring attention to the silence faced by LGBTQ youth who are bullied; the students’ silence is meant to echo that silence. With 90% of LGBTQ students reporting being harassed and 30% of LGBTQ students being physically accosted at school, this is a cause that is intended to make schools a safer place for those students. I personally have encountered students who have made remarks such as “Why remain silent? Shouldn’t you speak out against the bullying?” or “Being silent never accomplished anything, the Day of Silence is pointless.” I respect these opinions, but at the same time I feel that it is paramount to understand that the Day of Silence is not expected to make immediate change. The point of the Day of Silence is to get people’s attention and to make them think about why the day of silence is necessary. By grabbing people’s attention in such a strange way, it piques their interest to the point that someone who would brush off the subject of anti-LGBTQ bullying will now want to engage you in a conversation about it. I have been told by everyone who participated in our district that they saw this effect almost immediately. 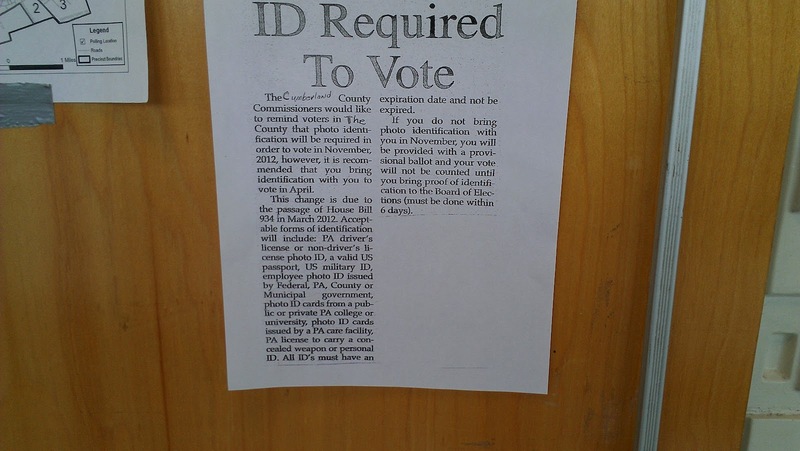 *Note: The GSA itself was only recognized as a student organization and allowed to meet on school grounds after the intervention of the ACLU of PA.
Voter ID’s "soft rollout" did not "work well"
Around the same time that the department released its statement, I was at a polling place in Cumberland County that had this sign posted. A volunteer who was working the polls for a candidate said that at least four people walked up to the sign and nearly turned around until the volunteer explained that they don’t need ID to vote in this election. We also heard that another polling place in Cumberland County had a similar sign posted, and that at least one Republican voter didn’t vote yesterday because of the sign. Meanwhile, four blocks from Secretary Aichele’s Harrisburg office at a polling place at St. Michael’s Lutheran Church, this sign was posted. I saw the same sign at another polling place in Dauphin County. If you can’t read the text on the white paper, it says, “BE PREPARED TO SHOW PHOTO IDENTIFICATION.” Elsewhere, we heard anecdotes of some poll workers insisting on seeing ID. This is what the Department of State means by “seemed to work well.” In other news, war is peace, ignorance is strength, and slavery is freedom. This is what voter suppression and intimidation looks like. In an election in which voters were not required to show ID, polling places were telling voters that ID was “required” and that they better “be prepared” to show ID. Now, the voter ID supporters have insisted that no one will be turned away on Election Day because the law includes a provision that allows voters without ID to vote by provisional ballot. They then have to show the county a copy of their ID within six days. That’s a soft form of disenfranchisement and is incredibly cumbersome. But signs that tell voters that ID is “required” contradict that awful part of the law. The ACLU of Pennsylvania did not actively blanket the state to watch how voter ID was implemented yesterday. These anecdotes fell into our laps. What kind of signs should we expect to see in November when the law is scheduled to go into effect? Perhaps something like this? That hasn’t been our experience. See my colleague Ngani Ndimbie’s account of her recent experience at PennDOT in Pittsburgh. Now we’ve even heard that PennDOT is not issuing free IDs to people with outstanding fines or to people who had an ID that expired within the last year. Where in the law does it say that you can’t get an ID to vote because you didn’t pay a parking ticket? The first month of the voter ID law has been a debacle. If Secretary Aichele and Governor Corbett want this law to withstand a legal challenge, the commonwealth will have to do a better job in court than its done so far in implementing this disaster of a law. Have you ever bullied a PennDOT employee into giving a man the free ID that he deserved? Until Wednesday afternoon I would have said, “No.” More on this later. Wednesday, April 18 was Pittsburgh’s voter ID action, held at noon at the Smithfield Street PennDOT Driver’s License Center in downtown Pittsburgh. The action was organized by the Protect Our Vote coalition and modeled after the event held in Philadelphia shortly after the voter ID law was signed by the governor. Driving down to the rally, I wasn’t expecting much other than what we put in the media advisory: a set of people getting free IDs, advocates holding signs, and a press conference. But it has been said that one has be an optimist to do the work of a community organizer. Perhaps that’s why I thought that PennDOT would be far more prepared to respond to the demand for free, state-issued, non-driver photo IDs for voting purposes. At the very least I figured, since our coalition of organizations and activists had been aggressively advertising for one and a half weeks, PennDOT would respond by putting their most polite, seasoned, and trained staff to work that day to prove us wrong. …Did I mention that I’m an optimist? On the day of the action people seeking free IDs for the purpose of voting each filed into the DMV with an advocate. So why would someone need an advocate to get a free non-driver photo ID? Because more than a month since the law passed, PennDOT employees were not trained, were not courteous, and were not ready. * Two people were forced to pay for their non-driver IDs because their IDs had not yet been expired for a year. So, while their IDs would be more than a year past expiration on November 6th and thus invalid for voting, they had to pay for IDs on Wednesday, April 18th. * A couple from Wilkinsburg who had lost their non-driver photo IDs were turned away. These citizens of the commonwealth (both currently unemployed) were told that they could not get a free ID for voting purposes because they had lost their previous IDs. Me: I’m sorry, could you explain why this gentleman can’t get an ID? PennDOT: The IDs are primarily for people who have never before had an ID in Pennsylvania. Me: [To the person I’m helping] You’re not a student are you? An employee of a college or university? A member of the US armed forces? Slightly embarrassed, exhausted Pennsylvanian: Um, no. I left the rally with a stack of intake forms and a furrowed brow. On the drive back I was fuming. Why were they making this so hard? Why weren’t they ready? And if that’s how I felt, I can guarantee that the people who came down to get voting IDs also felt…taxed. Certainly emotionally, some physically, and for a good number, financially. For years, members of my family, as well as my friends and acquaintances, have come to me for help with their run-ins with the police. They know I have represented many victims of racial profiling. They also know that I’m more than just a civil rights attorney — I’m someone who understands what they’ve gone through. I may fight racial profiling in the courtroom, but I also live with it in my everyday life. Just last August, I was pulled over twice in the span of 48 hours, when I was driving from Oakland, Calif., to Philadelphia to begin my new job as executive director of the ACLU of Pennsylvania. The trip, my first cross-country drive, was amazing. I was able to visit some national parks for the first time, such as Yosemite and Mount Rushmore, and to appreciate the beauty of our country in a way that traveling by plane does not often allow. But I was also wary, as I always am, of being stopped by the police and had been warned by friends to be especially careful in Michigan and Ohio. Their warnings proved prescient. On the trip, I was pulled over by a Michigan state trooper. I had spotted him in my rear-view mirror and knew that I had been obeying all traffic laws, so I was not sure why he pulled me over. He didn’t seem to know why either, because when I asked, he fumbled around for a response that was unintelligible. We both knew he had no reason, so when I shared with him that I had once litigated racial profiling cases for the ACLU, he let me go. But my triumph was short-lived. A day or two later, while driving in Ohio, I was pulled over again, this time for not coming to a complete stop in the parking lot of a fairly empty shopping center. The officer could barely contain his glee while writing me a ticket, and started asking probing questions about who I was and where I was traveling. I cut him off quickly, accepted the ticket and continued on my way. Thousands of minor traffic laws are violated every day, and most are ignored by the police. Rarely, however, do Black men receive the benefit of this discretion. Still, I consider myself relatively lucky to be able to escape those instances with only a sense of fury and a ticket. My cousin, Ron, wasn’t so lucky. One recent afternoon in Wilmington, Del., narcotics officers with the local police approached Ron near his home, ordered him out of his vehicle and slammed him against a truck. They threw him to the ground and two police officers held his hands and used their knees to press on his shoulders. Another officer sat on his legs, while the fourth officer kicked him. They punched him in the face. A canine unit was called to the scene to search his car, without his permission. The officers never bothered to ask Ron his name, hog-tied and arrested him and took him to the police station, where he was strip searched. No contraband was found in Ron’s car. Ron had done nothing wrong, yet he was charged with resisting arrest and failure to stop for police sirens. There were no sirens, and turns out, the narcotics officers simply had the wrong guy, which they admitted later. Ron, who is now in his mid-twenties, says he has been stopped by the Wilmington police approximately 20 times since he started driving at age 15. In fact, he was stopped again just weeks after this brutal incident allegedly for running a stop sign. He was let go without a ticket. Ron says that in eight of the 20 times he has been pulled over, officers had their guns drawn. When my family and friends come to me seeking advice about how to respond to their encounters with the police, I am not always optimistic that I can help them. I’ve litigated these cases for many years, and I know that part of the problem is the very high burden of proof in racial discrimination cases. That is why Congress needs to pass the End Racial Profiling Act, to make it easier to bring these cases. We have to have a way to fight back against those who have made it their job to target minorities for abuse or mistreatment. *Some details have been altered to protect privacy. This post originally appeared on the national ACLU Blog of Rights as part of its series on ending racial profiling. Take action. Urge your member of Congress to pass the End Racial Profiling Act, legislation sponsored by Sen. Ben Cardin (D-Md.) and Rep. John Conyers, (D-Mich.) which would, among other things, provide training to help police avoid responses based on stereotypes and unreliable assumptions about minorities. Across the pond, Great Britain is talking about extraordinary new spying power that would allow the government to monitor all communications without judicial approval. The British author George Orwell’s nightmare could come true. Here in Pennsylvania, no one is going quite that far. But don’t give them any ideas. Using fear of crime (of course) and new technology as their wedges, government officials- specifically the commonwealth’s prosecutors- are itching to open up the state Wiretap Act to make it easier to obtain our communications without dealing with those pesky courts. Mobile phone service providers archive your phone’s location data. They know approximately where you’ve been for weeks. While one can understand the practical and benign reasons for collecting such data, e.g. tracking where to construct new towers, this data provides electronic footsteps of your every move. In their Wiretap Act proposal, government officials want to obtain that data with a standard less than probable cause. Their proposal has been changing and is something of a moving target, but essentially, they don’t want to show a court that they have probable cause that a crime has occurred and that the phone was used in the commission of that crime. The ACLU of Pennsylvania believes that they must show probable cause and obtain a court order before getting that data, as mandated by both the federal and state constitutions. Let’s bottom line this: In their attempt to debase the Wiretap Act, these government officials want to gather more power for themselves, and they’re using fear to convince lawmakers to go their way. No one should be fooled into believing that this is the end of their power grab either. At a hearing last month before the Senate Judiciary Committee, Chief Deputy Attorney General Erik Olsen told the committee “we’ll be back” for more revisions in the future. Big Brother is watching. And he wants to watch more. The U.S. Department of Education (DoE) recently released comprehensive data about the educational opportunity offered to the nation’s public school students. Known as the Civil Rights Data Collection, this dataset draws from a national survey of 72,000 schools serving 85 percent of the nation’s public school students during the 2009-2010 school year. The data includes a profile of the School District of Philadelphia, which paints a disturbing picture, especially in the areas of discipline and the equitable assignment of experienced teachers. Perhaps the most significant national finding is that black students are far more likely to be suspended or expelled from school than their peers. In addition, black and Latino students are more likely to be concentrated in schools where there is a concentration of teachers with little experience and a rigorous curriculum is not offered. What does this data say about the equality of opportunity provided to Philadelphia’s public schools students? Black students make up about 63 percent of the District, but receive 77 percent of out-of-school suspensions. A black student is 2.4 times as likely as a white student to receive an out of school suspension, 3.71 times as likely to be arrested, and 3.95 times as likely to be referred to law enforcement. Expulsions, the removal of students for more than 10 consecutive days, are almost exclusively a black affair. Black students receive 86 percent of expulsions under zero-tolerance policies. Latino students do not fare much better. They are 1.63 times as likely as whites to receive out of school suspensions, 2.55 times as likely to be arrested, and 2.59 times as likely to be referred to law enforcement. Some 13 out of every 100 black students, 9 out of every 100 Latino students, 5 out every white students, and 2 out of every Asian and Pacific Island students receive an out-of-school suspension. 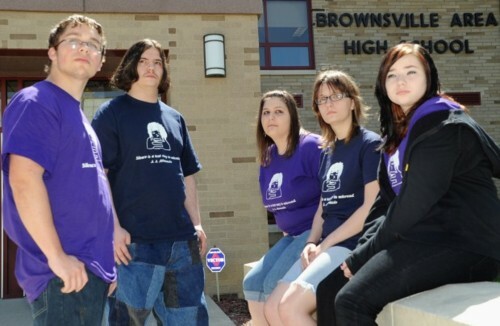 Discipline of students with disabilities: While black males make up 32% of the district’s students, they make up 58% of the students with disabilities receiving out of school suspensions. Who teaches the children who go to these schools and what are their levels of teaching experience? In schools with the highest black and Latino enrollment, 25% are novice teachers while only 13% are novice teachers in schools with the lowest black/Latino enrollment. Teachers in schools with the highest black and Latino enrollment were paid an average of $14,699 less than teachers in schools with the lowest black and Latino enrollment. This gap is the greatest of the top 20 largest school district in the country.By comparison, the gap is $8,222 in New York City and $950 in Los Angeles, the nation’s two largest districts. The average gap nationally is $2,251. Local community campaigns have taken on these issues during the past decade. Last week Philadelphia City Council held public hearings on the impact of the District’s “zero-tolerance” practices. In 2010, ACTION United released a report detailing disparities in the assignment of experienced teachers to schools serving low income communities. We should heed his words.